… and happening! Landauer Publishing is publishing my second book, available this Fall! Thank you to Vivian for spotting the announcement and wrote to tell me about it. I am very excited! More book details to follow… Gotta run for now! This entry was posted in Quilting and tagged Creative New Quilts & Projects, Landauer Publishing, Precuts Quilt Book, Wendy Sheppard Designs. Bookmark the permalink. Wow!! Wendy!! I am so excited for you, another book. I know it will be fabulous as you never disappoint. I’m excited to see it!! How very exciting….Congrats! Like you it seems that every quilt I make becomes a favorite. LOL. Which is one of the wonderful things about being a quilter. Have a great day! What a woman!! Congratulations & I’ll be looking for it!! Congrats on your second book! I’m so excited! I have some precuts that are waiting for a good design. I can’t wait to see this! Thanks. Congratulations, Wendy!!! This looks like a great book! 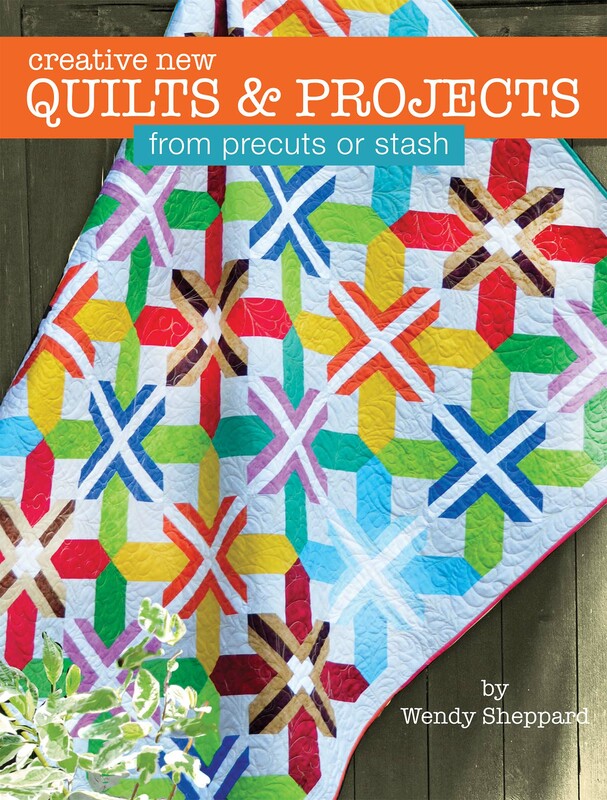 Oh my gosh Congratulations I just know it will be another spectacular book with gorgeous quilts and wonderful directions. Congratulations! I’m excited because I have loads of precuts not to mention stash that need made into finished quilts! My daughter is crazy for birds, then there is the espresso (my personal fuel) one, the cute boat and bow quilts… they are all destined to be favorites! Congratulations—again!!! I knew book #1 was just the beginning. I can hardly wait…the only thing that would have made the first book better was if it had been autographed by my favorite quilter—Wendy Sheppard! I’m still working on my own Calico Trail—-it is soooo beautiful. Blessings…give Miss Baby G a hug. Looking forward to seeing it! The cover is very pretty and enticing. Congratulations Wendy – what a beautiful book. So happy to be one of your fans! (((hugs))) to you and Miss G! Wow! Shaking my head…don’t know how you manage to do it all…with so much grace and style! Hope it will be out in time for festival in Houston! I know my many quilting friends and I love to find new projects for our pre-cuts. You truly rock our quilting world! Congratulations! WOW I can hardly believe it. I am looking forward to seeing the rest of your projects in the book. I see your first book in Joann Fabrics all the time. Such exciting news, Wendy!! Eagerly looking forward to seeing the rest of your “favorite” quilts!!!! Congratulations Wendy……I look forward to purchasing your next book. Congratulations, I look forward to purchasing this book as well. Not sure if your aware but they are remaking Anne of Green Gables…Martin Sheen is going to be Matthew. Wow, you are indeed a busy lady! Looking forward to book 2. So exciting. The cover is beautiful and so cheerfully inviting. Congratulations.